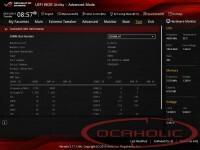 The most recent version of ASUS’s UEFI BIOS presents itself with an attractive design, and especially the new interface which called EzMode, where we can not only monitor system information, CPU and motherboard temperature, CPU voltage and DRAM status but also set system and CPU fans as well as directly change the boot priority and tune the system to different profiles, is leaving a good impression. If you wish to go back to the good old times, where you were racing through the menus hammering up and down arrows as well as the enter key ridiculously fast, you just have to press F7 and there you go. Since this motherboard features a very solid power design it is suitable for gaming and high overclocking. The BIOS features all the usual ASUS options, which allow for altering virtually anything when it comes to overclocking. Overall, there is certainly no lack of options in this BIOS.